Social Media Week Lagos is in a month and if you haven’t already, it’s time to buy your plane tickets. You will also need a visa to Nigeria. Information on how to get a tourist visa is here. One of the items you will need for your visa is proof of departure. For many of us that means a plane ticket. Here are some ways to buy your cheap ticket to Lagos. There are many portals to book your flights right now, which include the usual suspects such as kayak.com, expedia.com and orbitz.com. Or you can go with airfarewatchdog.com, routehappy.com or the simple interface of Google Flight Explorer. Have an idea of your itinerary and plug it into a few booking sites to see where you get the best deal. A flight from New York City to Lagos on routehappy.com is $780USD with a layover in Atlanta. Not bad. It’s pretty good. Flights to West Africa from New York can sometimes be double the price. Once you find a cheap flight, try to book directly with the airline as opposed to on the booking portal. More on the benefits of doing this later. If it’s possible, be flexible with the time you depart and arrive. Usually, leaving Friday-Sunday will increase your price. My best results for flying when I plugged in my dates were leaving New York on Thursday, February 13th and returning Monday, February 24th. This would allow me to explore Lagos for a few days before Social Media Week Lagos kicks off on February 17th. It also gives me a few days after the conference to take a trip outside of Lagos. When I plugged in my flight to leave on Friday, February 15th and return Sunday February 23rd, Google Flights alerted me I could save $74 if I leave on Thursday and return Monday. This is a tough one and it’s unsure if there is a hard-and-fast rule to go by anymore. I always seem to get my best deals Tuesdays-Thursdays. Business Insider adds that Saturday may be a great day as well. If you have time for your next trip, experiment with days. 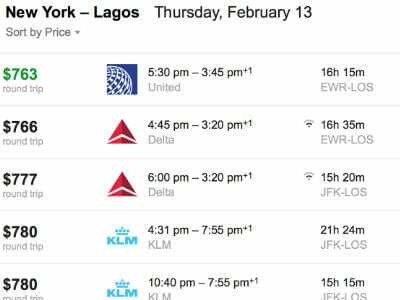 For Lagos, you might want to book as soon as possible. This may be the critical point where fares can jump to exponential soon. If you have frequent flier miles, you should definitely use those towards your flight if you can. If you don’t, before you even book your flight make sure you sign up with an account with an airline in each of the three airline alliances: One World, Sky Team and Star Alliance. For example, I have frequent flier accounts with United (Star Alliance), Delta (Sky Team) and American Airlines (One World). This is where booking directly with the airline is important. This would allow me to use my frequent flier miles on a future flight with a different airline that’s in the same alliance. For example, if I book my flight to Lagos with Delta, I can use the miles that I earn on that flight to get a cheaper flight to Mexico City on AeroMexico on a later trip because both of these airlines are part of the Sky Team Alliance. You can also rack up miles be making purchases with a certain credit card or signing up for new credit cards. Find out what your frequent flier program offers. Bonus: If you really want to get into travel hacking, check out Chris Guillebreau’s site Travel Hacking Cartel. There is a monthly fee, but you can hack some of the information by signing up for the 14-day trial for $1USD. You can cancel your account anytime before the trial ends, no questions asked. The theme for Social Media Week Lagos 2014 is A Connected Africa is the Future. If you have any questions about traveling to Lagos, please contact yours truly at roxanne@societyhae.com. I hope to see you in Lagos.